Kevin Harvick did what he needed to do to advance into the second round of NASCAR’s Chase on Sunday, winning the AAA 400 at Dover International Speedway. 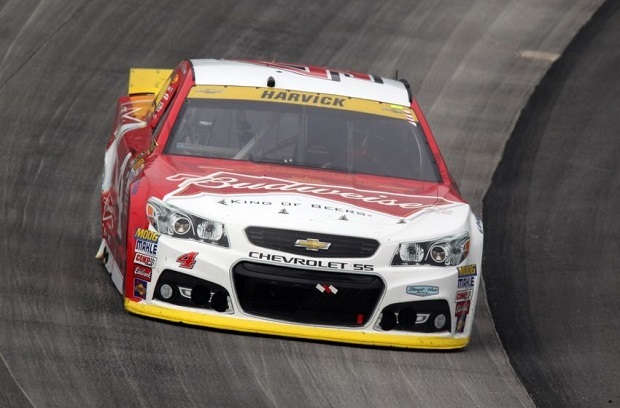 Harvick pretty much crushed the field,he led 354 laps Sunday earning the third automatic berth.Harvick was stuck 15th in the standings and had to basically win to keep his title defense rolling. Sunday was his first victory at the Monster Mile in any NASCAR series. Kyle Busch, Dale Earnhardt Jr., Jamie McMurray and Aric Almirola completed the top-five finishers. Johnson entered today fifth in the standings and, with 10 career wins at Dover, seemed a definitive lock to advance. His No. 48 Chevrolet was forced off the track for 36 laps with a torn rear axle seal and he dropped dearly in the standings. Unable to make repairs on pit road, Johnson took the car to the garage as the race continued under green-flag conditions. The team made repairs to the car’s rear-axle seal and sent him back on the track — but by the time he returned on Lap 139, it was far to late losing 37 laps to the lead car. Jamie McMurray, Paul Menard and Clint Bowyer also were eliminated as the Chase field was sliced from 16 to 12. Dale Earnhardt Jr. tied with McMurray in points and earned the final spot on a tiebreaker, having finished one position up. Four more drivers will be eliminated in the next three-race segment that starts next week at Charlotte Motor Speedway. Truex survived after he was sent to the rear for the field after his team made an unapproved adjustment to the right rear after inspection. Gordon’s drive for a fifth championship is still alive in his final season.Last week, Kyle Busch hit the wall at New Hampshire and suddenly found himself in the bottom four drivers. With Busch having to put on a big performance to avoid elimination this week, Busch did what was required finishing top-5 on the day.